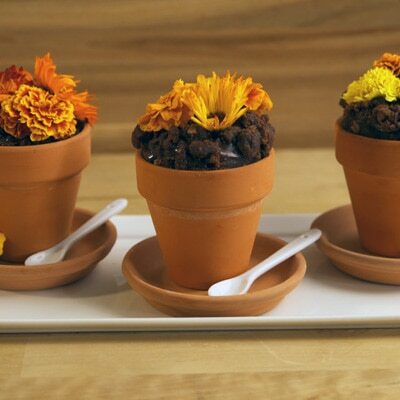 These flowerpot brownies from Elise Strachan of My Cupcake Addiction are almost too cute to eat. Welcome in spring with a festive, fun, and delicious brownie idea. PREHEAT your oven to 320° F. Place butter into a saucepan over a medium heat and bring to a gentle boil. Turn heat OFF and then add semisweet chocolate morsels stirring intermittently until the morsels have melted. Remove from heat and allow to cool slightly. COMBINE 3 eggs, vanilla and sugar into a bowl and beat with an electric mixer until the mixture has almost doubled in size and is light and fluffy - at least 7 minutes. SIFT the flour and cocoa together into a bowl. POUR the melted chocolate mixture into the egg mixture and gently fold the two together using big round figure 8 movements. Stop mixing as soon as you no longer see vanilla streaks through the chocolate batter being careful not to overmix. Re-sift the flour & cocoa evenly over the top of the chocolate mixture and fold together, again, using the figure 8 action. Add half of your peanut butter and chocolate morsels and gently fold them through. LINE the base of a brownie tin, pour in the brownie batter and bake for 20-25 minutes. The top should start to look a little flaky and the middle should spring back lightly when touched. Remove from oven and allow to cool for 15 minutes before running a knife around the outside edge and turning onto a cooling rack. REFRIGERATE for 30 minutes. Meanwhile, make the ganache by pouring the cream over the remaining half of the peanut butter and chocolate morsels in a heatproof bowl and stirring over low heat until the morsels have fully melted and combined with the cream. Set aside. CUT 12 x 5.5 cm rounds and 12 x 6.5 cm rounds from the cooled brownie using cookie cutters. Crumble your brownie scraps to yield 1 cup of brownie crumbs. STACK a smaller brownie round in the base of 12 miniature terracotta pots, each lined with a cupcake liner. Top with a tablespoon of ganache and a larger brownie round. TRIM the sides of your brownies angling towards the top edge of each terracotta pot, using a serrated edge knife to create a domed shape. TOP each brownie pot with 2 teaspoons of ganache and use the back of a spoon to evenly distribute. Sprinkle brownie crumbs sparingly on top to resemble dirt (Note: flowers will need to adhere to the ganache and too much brownie crumb will stop them from sticking). FINISH with assorted edible flowers grouped into like colors covering the domed brownie. * Suggested options for flowery and greenery: nasturtium, marigold, calendula, violets, orchids, pansies, snapdragons, mint leaves, rosemary and lavender.